music – Sara S. Goek, Ph.D.
Danny Meehan outside his restored family home in Donegal, June 2012. Photograph by Sara Goek. Fiddler Danny Meehan was born in 1940 and grew up in Drimalost, in the Blue Stack Mountains of south Donegal, in a family and local area with a rich musical heritage. At age sixteen he migrated first to Selby in Yorkshire. He worked in many places across Britain, finally settling in London in 1963 where he established a career as a self-employed stonemason. He also met and played with many great musicians in pubs, folk clubs, and concert halls in London. He appears on the album Paddy in the Smoke, with the group Le Chéile, and has two solo albums. He returned to live in Donegal in 2007. In 2012 TG4 honored him with the Gradam Saoil (Lifetime Achievement Award). However, that biography doesn’t do him justice. He is a larger than life character – humorous, generous, self-effacing, and, as he says himself, still a bit wild. Those traits come through in his music as well – his clever variations on traditional tunes, his unwillingness to put his own name to original compositions, and, having lived through what he calls a “dark age” for music, an appreciation for the young musicians of today. His is a music shaped by his roots in Donegal, his 50 years in England, and the many musicians he heard and played with along the way. Out of curiosity, during the interview I asked Danny about his grandparents, because I’d read that his grandfather migrated to Pennsylvania in the late nineteenth century and returned to marry and settle down in Donegal. Danny’s response became the focus of an article, “‘Most Good Stories Are True, You Know’: History, Tradition, and Identity in a Family Story” in The Irish Review (vol. 53, 2016). In conjunction with that article, I have put my full oral history interview with Danny Meehan and recordings of his music on my PhD project website, Voices of Irish Music & Migration. The specific audio clips referenced in the article are also available from The Irish Review‘s website. Huge thanks, of course, to Danny for sharing his stories and music. Thanks to Aidan O’Donnell for initially helping me get in touch with him. Danny’s nephew John Daly kindly provided additional information on the Meehan family history and the family photographs. Thanks to Clare O’Halloran and The Irish Review for supporting the publication. Kevin Henry at a festival in 1999 (photo courtesy of the Henry family). Before I met Kevin Henry in April 2013 what I knew about him primarily rested on his reputation as a musician and raconteur. He comes from the same area on the Sligo-Mayo border as Roger Sherlock and Brendan Tonra, both of whom I’d interviewed and Brendan I had the pleasure of playing tunes with during my time in Boston. I knew also that Kevin had been a mainstay of the Chicago Irish music scene for decades. What I was unprepared for was the fascinating story of his circuitous journey from Ireland to Chicago and the aplomb with which he related it. Kevin was born in 1929, the eighth of eleven children. Following in the footsteps of his older siblings, he left Ireland for England in 1947. He traveled up and down the country working as a seasonal agricultural laborer, coal miner, and construction worker. In 1953 he decided to seek his fortune across the Atlantic and booked passage to Canada, though his ultimate goal was America. He worked his way from St. John’s, Newfoundland to Toronto and finally across the border to New York, where other siblings lived. There, he worked digging tunnels and waiting tables before deciding to head for Florida’s sunnier climes. Unimpressed with the low wages paid laying pipes in the Everglades or working on the construction of a hotel, he moved north again, this time to Chicago. Apart from a four-month stint mining copper in Butte, Montana, he has remained in Chicago ever since. He spent 37 years as an iron worker, a career that included work on the iconic Hancock Tower. Throughout his life traditional music has remained a touchstone for his identity. Now 87, Kevin continues to work to sustain the culture of his native land and the legacy of music collector Francis O’Neill in his adopted home. Kevin’s life and the myriad ways he remained connected to his Irish identity are the subject of a new article published in the Transnational Ireland special issue of Éire-Ireland (vol.51, 2016): “‘Looking for that Pot of Gold’: The Transnational Life of Kevin Henry”. In conjunction with that article, I have put my oral history interview with Kevin Henry, photographs, and recordings of his music on my PhD project website Voices of Irish Music & Migration. More material will be coming soon – stay tuned! A huge thank you to Kevin and his wife Pauline for sharing their time and their stories with me! I was saddened by the news that flute player Roger Sherlock passed away last week. He kindly welcomed me into his home in Bettystown, Co. Meath in May 2011 and shared stories about his life and music. Roger was born in 1932 in Cloonfeightrin, Co. Mayo on the Sligo border and grew up surrounded by music: his grandfather played flute and whistle, his father sang, and his mother played melodeon. It was also a musical region: he went to the same school as fiddler and composer Brendan Tonra (late of Boston) and flute player Kevin Henry (now of Chicago) grew up about two miles away. While all these musicians were born on the Mayo side of the border, the region’s proximity to south Sligo and its famous fiddle players has led them to be associated with that tradition. It was also an area with a high rate of emigration: Roger went to London in 1952 where the first musician he encountered was west Limerick flute player Paddy Taylor. During the mid-1950s he shared a flat and played music with Clare piper Willie Clancy. He led bands in the Irish dance halls and played with the Thatch Céilí Band when they won the All-Ireland title in 1986 and 1987. He also played regularly in the city’s many Irish pub sessions. Roger and his wife, Mona, returned to Ireland and settled in Bettystown, Co. Meath in 1994. Did you ever hear tell of the White Hart in Fulham Broadway? I played there for twelve years. We used to play there three nights a week and Sunday morning. There was this gentleman from Killasser in County Mayo, he used to come in every Sunday morning. He was a contractor; he was a plasterer. He used to play the war pipes, you know the pipes with the drones on the shoulders, he used to play those and he used to play the flute. He had an accident at work with a mixer, you know them mixers? He got his arm caught in the mixer and it pulled his arm from here out, so that finished his playing. This Sunday morning, he was very dedicated to the music, this Sunday morning anyway he came in and he something wrapped up in paper under his arm. He came up to the stage to me and he said ‘Roger, I want you to have this.’ I said, ‘what is it?’ He said, ‘it’s something I want to give to you ‘cause I cannot play it anymore.’ So he said, ‘you keep it.’ That was it… Wasn’t it a lovely present? Tom Kenny was his name. He’s dead now, years. I could never forget, of course never will forget him. Until someday I hope I never will [sell the flute]. Over the last several months I read two books that approach the twentieth-century folk revival(s) through the medium of oral history: Singing Out: An Oral History of America’s Folk Music Revivals by David King Dunaway and Molly Beer (Oxford University Press, 2010) and Singing from the Floor: A History of British Folk Clubs by J.P. Bean (Faber & Faber, 2014). Both use oral history to great effect, adopting a similar format whereby the authors arrange interview quotations in dialogue in chronological and thematic sections. Dunaway and Beer’s book is based on interviews collected over more than thirty years, as well as additional sources, and historical narrative is interspersed with the voices of the participants. Bean’s work is somewhat more limited, being based only on his own recent interviews, thereby excluding singers who passed away in the intervening years (though many are discussed in absentia by their contemporaries). Taken together, they paint a broad picture of the trans-Atlantic folk scene in the twentieth century through the stories of its movers and shakers. As I read these books, I realized that I was spending a considerable amount of time delving through my iTunes collection and the vast realms of YouTube listening to recordings of songs and singers mentioned in the texts. Neither book came with a CD or playlist, so I’ve created my own. These five songs receive prominent mention and encapsulate the development of the British and American folk revivals and the links between them across space and time. The song ‘Barbara Allen’ originated in England or Scotland at least three hundred years ago. It appears as number 84 in Francis J. Child’s multi-volume collection from the late nineteenth century, English and Scottish Ballads. This work contains variations of 305 songs comprising a ‘canon’ found on both sides of the Atlantic, including two versions of ‘Barbara Allen’ (though dozens, perhaps even hundreds, of versions of the song exist). Jean Ritchie was born into a family of singers in Kentucky and rose to prominence on the folk scene from the late 1940s. She and her husband George Pickow received a Fulbright grant to travel to Britain and Ireland where they collected music and photographs. There they followed in Child’s footsteps by tracing links between the British, Irish, and American traditions, but unlike him they collected primarily from living people. This shift from collecting static, often edited, words on a page to live performance (enabled by improved recording technology), represents a key shift from the earliest folk collectors to the post-war revival. Across the Atlantic, the British folk revival was in full swing and people and songs went back and forth. Two of the most influential participants on the British side were Ewan MacColl and Peggy Seeger, whose marriage in itself signifies the ties that crossed the ocean. While MacColl is sometimes disparaged for his purist tendencies and role in the conservative Critics Group, he was a powerful force within the movement and also wrote some very fine songs. ‘Shoals of Herring’ was written for the BBC Radio Ballad Singing the Fishing (broadcast in 1962) and has since entered the folk tradition. The one person who gets the most space in both books is undoubtedly Bob Dylan. He went from being a kid who hung around Greenwich Village to a major force on an international stage. While still relatively little-known, he visited London for four weeks from 1962-3 and appeared in a few folk clubs, to a mixed reception according to Bean’s interviewees. However, his skill in penning lyrics was widely acknowledged and American folk musician Happy Traum recalled of first hearing ‘Blowin’ in the Wind’, ‘it blew us away. I can visualize the moment’. 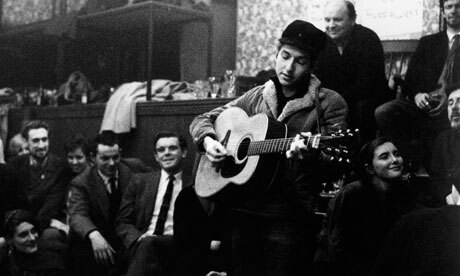 As one final link between oral history and the folk revival, listen to Studs Terkel interview a young Bob Dylan in 1963; he sings six songs, including ‘Blowin’ in the Wind’. Dylan is, I think, a final key in understanding the transformation wrought by the folk revival: it moved along a bumpy road from the collection of ‘authentic’ versions of songs, written in print, to recording of living traditional singers, to refashioning those old songs, to adapting the melodies and ideas into new songs, and bringing those and the whole tradition behind them to a popular audience. Some disliked the way Dylan ‘borrowed’ or used songs he got from others without acknowledging them and others disliked the fact that he ‘went electric’, but if even one out of ten Dylan fans moved from his music to interest in its roots, then the folk revival was a success. Folk music can only be folk music if it is a living tradition to which each generation gives new meaning. In Bean, Singing from the Floor, p.160. In Dunaway & Beer, Singing Out, p.124.